It is no exaggeration to say that a strip of land along Syria's northern border with Turkey is home to the most radical experiment in democracy and gender equality, not just in the Middle East, but in the whole world. Western Kurdistan, or Rojava, “the land where the sun sets”, first entered popular consciousness in that lopsided way that news from elsewhere hits Western TV screens, when Kurdish women fighters liberated Yazidi women and children from ISIS on Mount Sinjar in 2014. While the might of the US, the Free Syrian Army and the other regional armies in Iraq were unable to stop the advance of ISIS, young women in military fatigues and floral scarves defeated men who can barely tolerate fully covered-up women. Such film footage was undeniably eye-catching. Yet rather than leading to further information and analysis of the Rojava phenomenon, it was appropriated for the purposes of capitalist consumerism. H&M tried to sell a range of clothing based on the women's uniforms, provoking outrage in the Kurdish community for trivialising their struggle. 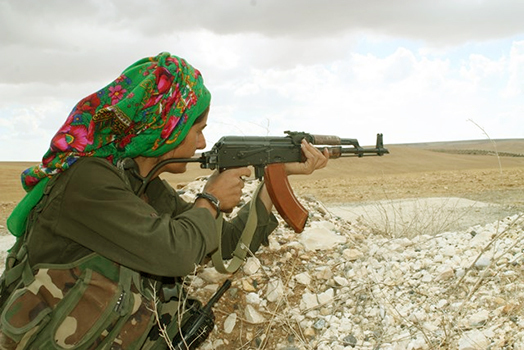 So who are the Women's Defence Units (YPJ), and what kind of society are they defending? Inspired by the evolving ideology of Abdullah Öcalan, the imprisoned leader of the banned Kurdistan Workers' Party (PKK) in Turkey, and triggered by the “Arab Spring”, the Kurds of Rojava began their struggle for autonomy in 2011, and their autonomous self-administration was formally set up in November 2013. Öcalan, unlike any other male freedom fighter to date, has placed women at the centre of his vision of a liberated, democratic society with a system of co-presidentship, a man and a woman sharing power at every level. The political vacuum created by the chaos in Syria allowed this experiment to flourish compared to similar attempts in southeastern Turkey, which have been met with the brute force of the Turkish government. The YPJ, estimated to be between 7500 and 10,000 in number, is not to be confused with the Peshmerga forces of the Kurdistan Regional Government across the border in Iraq. Alongside the People's Protection Units (YPG), a force consisting of both men and women, the YPJ works closely with the military wing of the PKK and is also part of a newly constituted fighting force, the Syrian Democratic Forces, an alliance of Arab, Assyrian, Armenian, Kurdish and Turkmen militias, which targets ISIS and other Islamists in the Syrian opposition. When I visited Rojava I was able to catch up with Nesrîn Abdullah, commander and chief spokesperson of the YPJ. Nesrîn joined in 2011. “I had two reasons to become a fighter. We were under the control of the Assad regime, which abused us as Kurds. As women we were abused by patriarchy. If you are a person whose land is invaded, then you are invaded as a person also,” she said. At 37, Nesrîn belongs to a generation of Syrians that received military training at school between the ages of 13 to 16. She then received a month's training when she joined the YPJ. She commands both men and women and does not report experiencing insubordination from men, as PKK women commanders did in the 1980s and 1990s. She believes that men are intimidated by strong women, but also says that the training is aimed at producing fighters with shared values and is reinforced by an ongoing system of group criticism and self-criticism. The intake includes people joining with very different motives: defence of the homeland; liberation of the people; and escaping poverty and, in the case of women, conservative families. Sexual relations between fighters are banned and sexual violence is taboo: “If somebody dares to do it, he will be arrested,” Nesrîn said. Men and women are allowed to get married, but the women are then expected to leave the force — the only evidence of institutionalised inequality that I unearthed, which was justified on the basis of “our conservative society”. Nesrîn was keen to emphasise that the YPJ is a defence and protection force: they would under no circumstances attack or invade someone else's territory unless they were being threatened. This may sound naively optimistic, but the YPG and YPJ have been successful in not only defending but also winning back territory from ISIS fighters who are arguably also spurred on by belief, albeit in a medieval and twisted form of Islam. But belief is not the only drug that ISIS fighters rely on. They also take captagon (a form of amphetamine) to make them feel invincible. A wounded YPG soldier confirmed to me that he had found drugs on the ISIS fighters he had captured, alleging that captagon even stops them falling after they are shot. Money is a motivator, too: morale in ISIS has reportedly dropped in line with cuts in salaries as oil revenues declined. The YPJ, by contrast, is a volunteer force. Nesrîn does not get a salary. She sleeps and eats wherever her work takes her — to a military camp or an office. The families of the poorer women in the YPJ are given some financial compensation, approximately £S40,000 (less than $100) per month. Their role as the most effective fighting force against ISIS has brought US support in the form of air cover, much to Turkey's chagrin. However, Rojava's anti-capitalist ideology is almost more dangerous to the US than the religious fundamentalism of ISIS. The US has failed to use its considerable leverage to persuade Turkey and the Kurdistan Regional Government to lift the trade embargo on Rojava, yet without building materials and medicines, redevelopment is being choked off and human suffering exacerbated. In addition, the US is refusing to support Rojava's demand for autonomous federal zones as a solution to the Syrian crisis. It is quite likely that the US will brand them PKK puppets and throw them to the wolves as soon as their usefulness is over. We should pre-empt that possibility, not just by asserting Rojava's independence from the PKK, but by campaigning to remove the PKK from the list of terrorist organisations in the US and other Western countries. Not only have its leaders renounced violence, but its ideology has filled out the once-hollow institutions of democracy with a real grassroots enthusiasm for political change, driven by women's equality.